Manuel Gònima ( Lleida 1710 - Girona 1792). 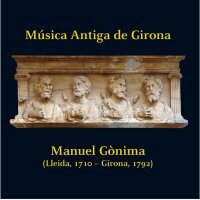 He was choirmaster between 1735-1772, in the middle of the 18th century when the great changes of the Enlightenment began to arrive in Girona. The son of a Bourbon militaryman, he seems to have received his musical education in Barcelona and obtained his post in Girona at the age of 25 with the support of prominent canons, without having to perform the usual examination exercises; so great was his reputation. The Girona that Gònima came to was a city in expansion and recovering from the demographic descent caused by the wars against the France of Lluís XIV. The cathedral was being completed with the building of the great staircase. The façade was almost finished and the interior was being decorated with a series of large altarpieces. Gòmina did not have to suffer any sieges, only the fear of famine and plague. Consequently, his compositions show a joyous inspiration, less restrained than his predecessors. The texts- in Latin and Spanish - do speak of sorrow however, as some of those that we present today. With Gòmina, the transition from baroque to galante style music was completed.This consisted in the following: simplification of the polyphony, preference for vertical harmony leaving aside the counterpoint of the previous period plus the use of the new musical dynamics, melodic clarity, the presence of interpretive resources to draw attention to grief and sublimated love. These are elements that indicate the presence of a certain european bourgeois culture that had been consolidated, a minority phenomenon albeit, but of which we find several examples in Girona, not only in the sphere of music.